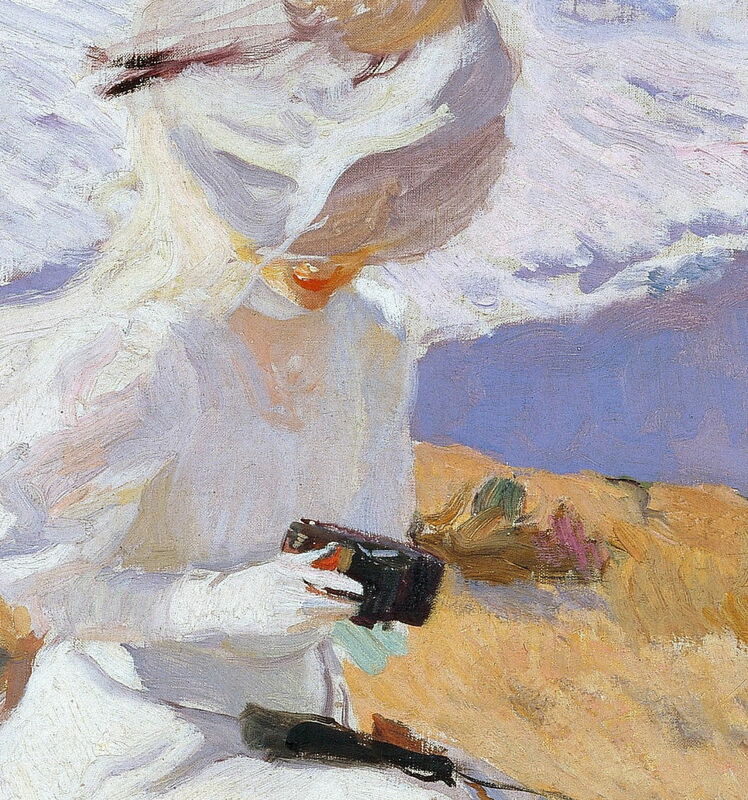 Joaquín Sorolla y Bastida (1863–1923), Capturing the Moment (detail) (1906), oil on canvas, dimensions not known, Museo Sorolla, Madrid. Wikimedia Commons. In the late 1800s, for a short period, a new method of painting in oils became prominent: that of the Divisionists and Neo-Impressionists. Instead of applying layers of paint, or working alla prima, they pursued specific optical effects by placing vast numbers of small dots, strokes, or tiles of high chroma oil paint on their grounds. Paul Signac, Notre-Dame-de-la-Garde (La Bonne-Mère), Marseilles (1905-6), oil on canvas, 88.9 x 116.2 cm, Metropolitan Museum of Art, New York. Wikimedia Commons. 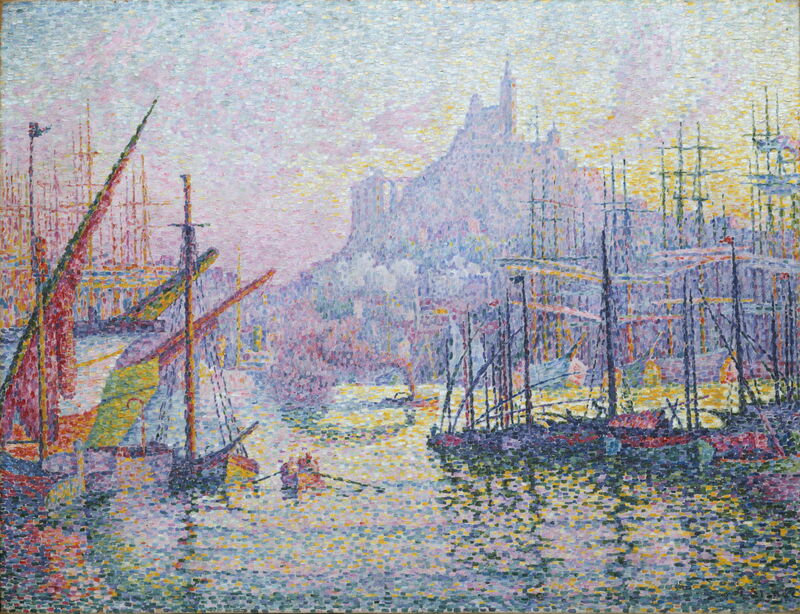 Paul Signac’s marks ranged from tiny dots up to quite bold tiles; at the time that he painted his Notre-Dame-de-la-Garde (La Bonne-Mère), Marseilles (1905-6), as the detail below shows, his patches of colour were small rectangular tiles. 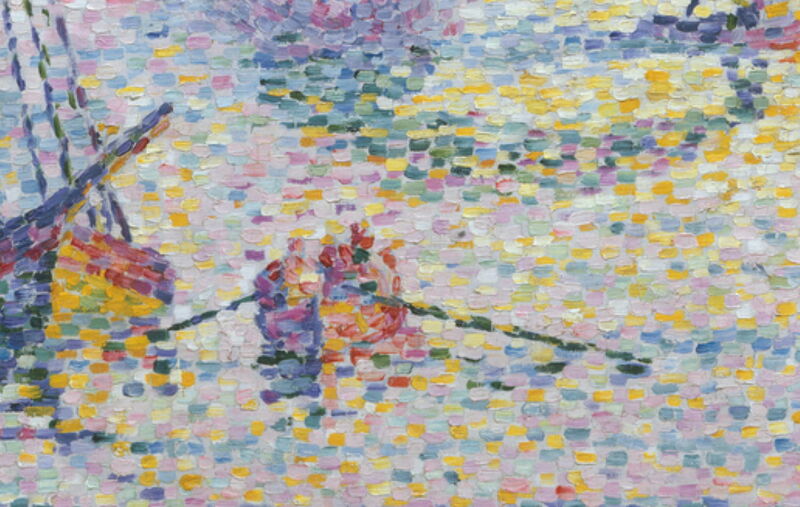 Paul Signac, Notre-Dame-de-la-Garde (La Bonne-Mère), Marseilles (detail) (1905-6), oil on canvas, 88.9 x 116.2 cm, Metropolitan Museum of Art, New York. Wikimedia Commons. This was novel, and soon passed. Many oil painters continued to work in classical layered, alla prima, or a free mixture of techniques. These are best illustrated by the work of three of the most technically-skilled painters at the start of the twentieth century: John Singer Sargent, Joaquín Sorolla, and Anders Zorn. 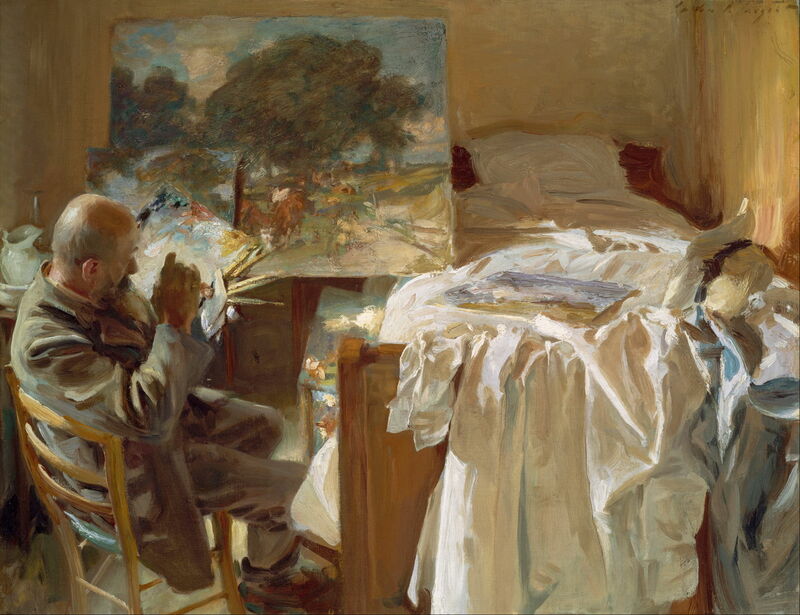 John Singer Sargent was classically-trained, and his brilliant paint-handling shown most appropriately in his An Artist in His Studio (1904). This also makes the point that artists like Sargent were now able to paint quite substantial works in the confines of a small bedroom, something impossible in the past. I doubt that his work was as well-appreciated by the housekeeper, though. 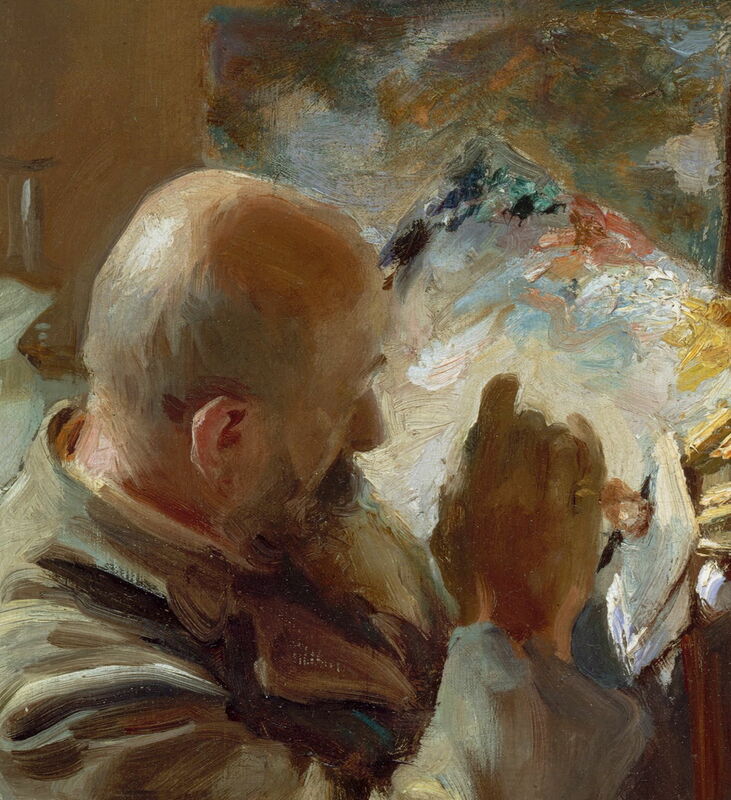 John Singer Sargent (1856–1925), An Artist in His Studio (detail) (1904), oil on canvas, 56.2 x 72.1 cm, Museum of Fine Arts, Boston, MA. Wikimedia Commons. John Singer Sargent (1856–1925), Gassed (1919), oil on canvas, 231 × 611.1 cm, The Imperial War Museum, London. Wikimedia Commons. Sargent’s Gassed (1919) shows him in more formal style, with one of the major paintings to result from the First World War, when as a War Artist he sketched mainly in watercolour. 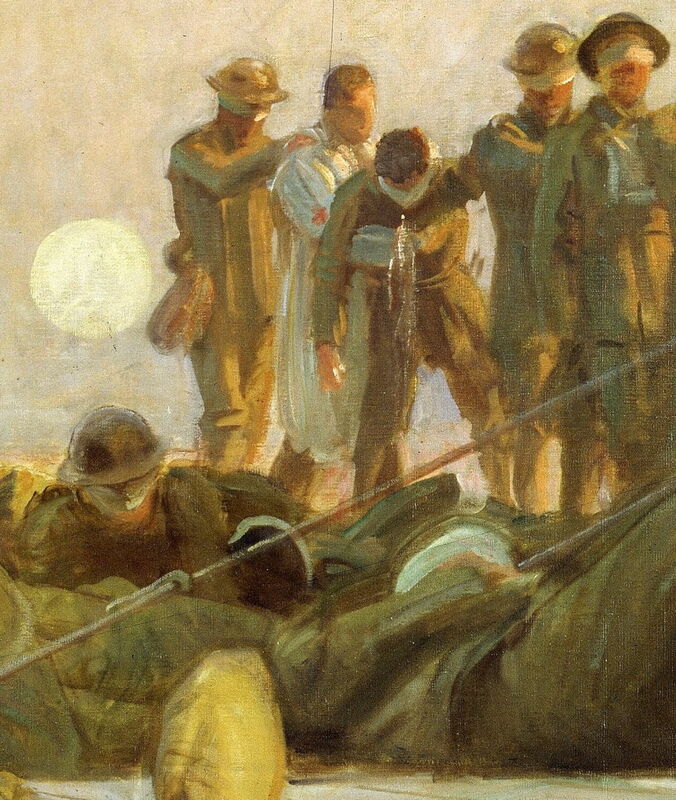 John Singer Sargent (1856–1925), Gassed (detail) (1919), oil on canvas, 231 × 611.1 cm, The Imperial War Museum, London. Wikimedia Commons. 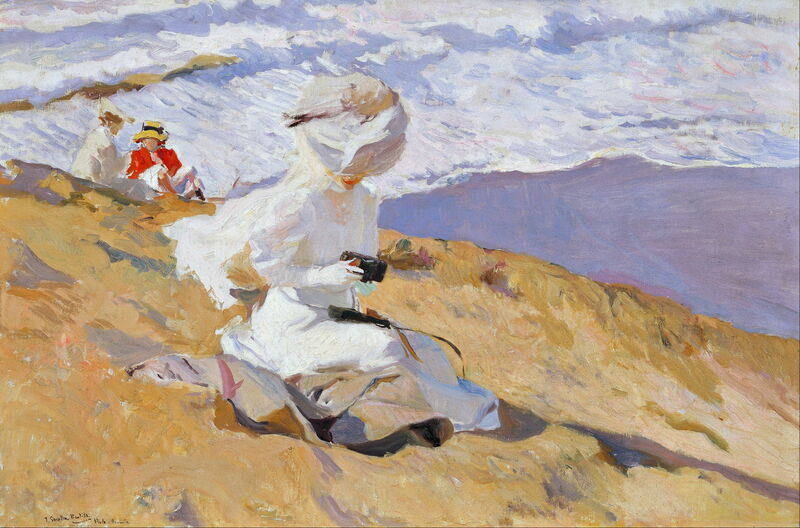 Joaquín Sorolla y Bastida (1863–1923), Capturing the Moment (1906), oil on canvas, dimensions not known, Museo Sorolla, Madrid. Wikimedia Commons. Joaquín Sorolla can only be described as a vigorous painter, who was very quick and physically active in handling brush and paint. This is shown well in his aptly-titled Capturing the Moment (1906), which interestingly centres on the rise of photography. Anders Zorn (1860–1920), I Werners Eka (In Werner’s Rowing Boat) (1917), oil on canvas, dimensions not known, Private collection. Wikimedia Commons. Anders Zorn’s I Werners Eka (In Werner’s Rowing Boat) (1917) is a more finished work, which shows his distinctive style (and most popular genre). 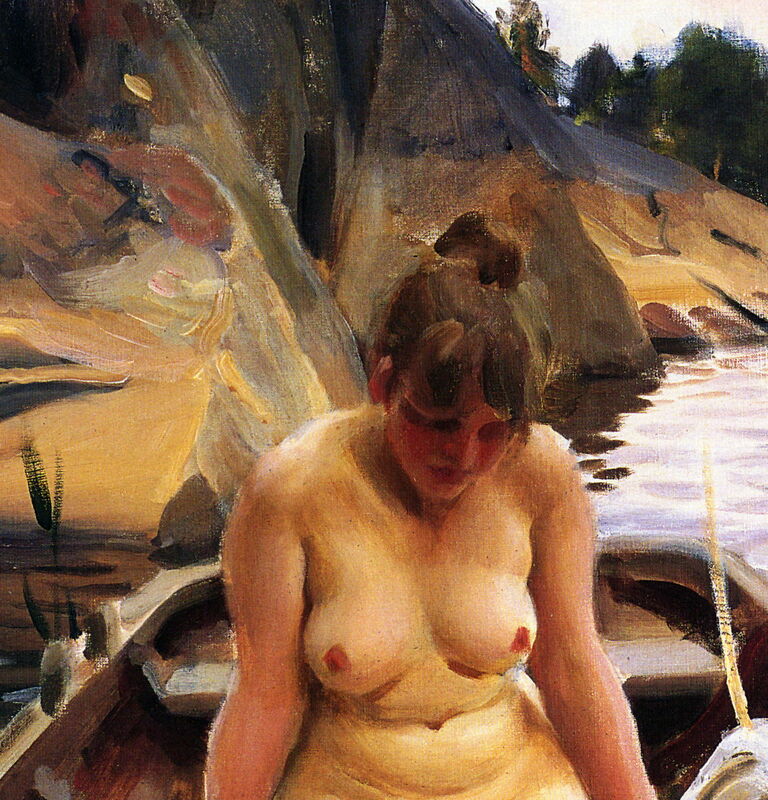 Anders Zorn (1860–1920), I Werners Eka (In Werner’s Rowing Boat) (detail) (1917), oil on canvas, dimensions not known, Private collection. Wikimedia Commons. In stark contrast were the Modernists, who worked their way through increasing levels of abstraction, until they painted colour fields, or poured and dripped paints of different types onto large canvases. Most cared as little for any rules or techniques of painting in oils as they did for representing any semblance of reality. Oil paints were mixed with water-based media, commercial paints of different types, and anything that they fancied. The end results are already causing considerable problems of conservation, as might readily have been predicted from centuries of experience. The strangest thing about the twentieth century is that those changes in painting occurred at exactly the time that we started to gain real insights into how oil paints work, particularly how they ‘dry’, and how the paint layer can fail. This growing understanding relied on the advances in chemistry, particularly of polymers, and the needs of the much bigger commercial paint industry. For much of the century, oil paints remained the standard for much non-artistic painting, particularly in buildings and construction. But advances in polymer chemistry brought a new type of paint which relied on a different drying mechanism: alkyds. For although slow drying is one of the great benefits to painting in oils, it is also one of its greatest problems. What painters have been seeking for centuries is some means of control over the rate of drying. This could be achieved by pre-polymerising the drying oil used as binder, and by siccatives added to it. But pre-polymerisation brought increased viscosity which often had to be countered by adding a solvent such as turpentine, and siccatives such as lead oxide (litharge) are highly toxic and can cause problems in the paint layer. Rather than alkyds replacing traditional oil paints, as some had expected, they have proved most versatile and popular as additives. When a painter is sketching in an underdrawing, it is not uncommon for that to include added alkyd medium, so that it becomes dry enough to paint over within minutes or hours (for a thin film in warm conditions). Others have found alkyd additives valuable in traditional layered glazes, where they can shorten drying time to just a couple of days, before the next layer can be applied. Alkyd paints are now well understood, and are proving themselves capable of producing a reliable and robust paint layer. Unfortunately technical understanding by painters is much less reliable, and it is likely that many paintings which use alkyd additives will suffer early cracking and relatively rapid mechnical failure. This is because of a long-known and reliable rule of thumb, based on the principle of applying fat over lean. From long before van Eyck, painters in oils have understood that the most stable and robust paint layers are constructed by ensuring that the deeper layers dry first. In the absence of siccatives and similar modifiers, paint which is rich in drying oil dries more slowly than paint which has a minimum of drying oil: hence the phrase fat over lean, to ensure that the lowest layers dry before the surface. When the surface layers dry and harden with deeper layers still liquid, those surface layers will be subject to mechanical stress as that deeper paint dries, causing cracking. Because alkyd additives are often referred to as a medium, and that is mistakenly assumed to mean ‘fat’ rather than ‘lean’ (even though alkyd resin is not a drying oil of any kind), many have assumed that it is safe to apply thin, alkyd-modified glaze layers over deeper layers without any additive. Another complication has been the more recent introduction of oil paints which can be cleaned up using water rather than organic solvents such as turpentine or mineral spirits. With rising concerns over the toxicity of those solvents (turpentine is particularly irritant and potentially toxic), and their environmental problems, many painters have switched to using what have quite incorrectly been described as water-soluble oil paints. These are in fact another benefit brought from the huge chemical industry, and demand for commercial paints, and are actually water-miscible. They consist of a supension of fine particles of oil paint, still with their drying oil included. Carefully packaged with a series of additives such as surfactants – detergents, as they are more commonly known – these are extremely convenient in use. They are also as yet unproven over the timescales that we currently expect of fine art paintings. Water-miscible oil paints give the illusion that, thanks to modern chemistry, oil and water do mix. Deepening understanding of oil paints among conservation experts and the array of scientists who now support them has raised a new issue in oil painting technique: the threat of soap formation in the paint layer. The triglycerides which make up drying oils will only polymerise into a robust paint layer in the right conditions – they require oxygen, for example – and very slowly. They can also, given different conditions, saponify, that is turn into soap, which has none of the physical properties required for a paint layer to last many centuries. Conservators have discovered that some apparently well-constructed paint layers in oil paintings can saponify to such an extent that they drop off the ground in large sheets, resulting in total loss of the painting. In other cases, deeper saponified layers can remain liquid, and ooze from holes and cracks which open in dry surface layers. Among the chemical factors which makes saponification more likely than polymerisation is the presence of water, particularly with additives which are now commonly used as surfactants. Soaps appear more common in oil paintings which have been made over acrylic grounds, another widespread modern practice, and with varnishes which can exclude the oxygen needed for polymerisation. We clearly still have much to learn about oil paint, painting with oils, and how to make paintings which will last as long as those of Rembrandt and van Eyck. I will close this penultimate article in this series with an example of technical accomplishment in oils, which I think is also brilliant art in the long tradition which I have been summarising. 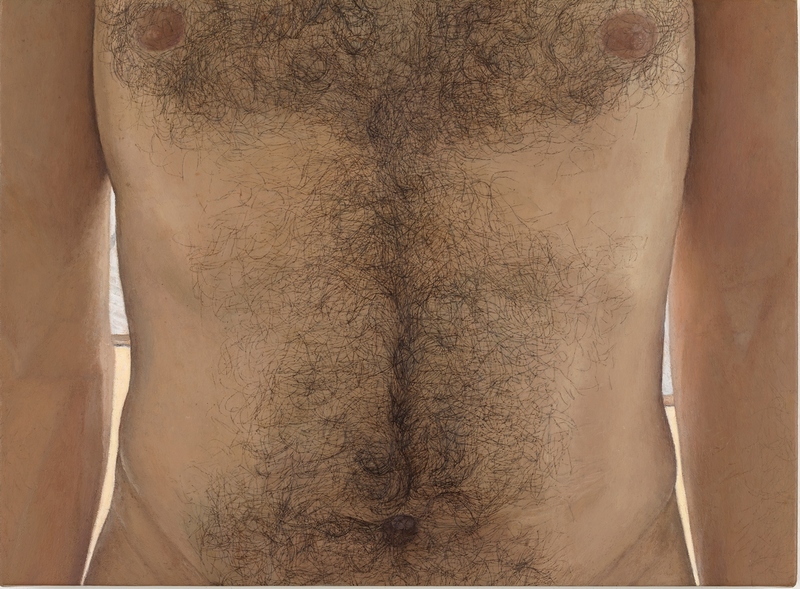 Ellen Altfest, Torso (2011), oil on canvas, 26 x 35.2 cm, ONE2 Collection, USA. Image courtesy White Cube © Ellen Altfest / White Cube. Fat over lean – on this blog. Ellen Altfest’s painting is included by kind permission of White Cube and MK Gallery and is © Ellen Altfest / White Cube. Posted in General, Painting, Technology and tagged alkyds, history of painting, modernism, Neo-Impressionism, oil paint, oil painting, water-miscible. Bookmark the permalink. Programming playgrounds: Swift on an iPad?